It will be strange if there will not be any ba kwa served during the CNY period. 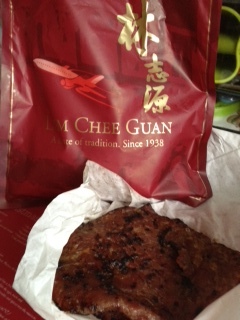 I like Lim Chee Guan's ba kwa because the texture is not tough and it's nicer in taste. So I went to buy 2 days before the reunion day with the thought that I might end up queuing for an hour just to buy a kilo of ba kwa. To my pleasent surprise was that the queue was not very long, around 20 people in front of me and it took me all in all only 20 mins to get my order processed! A kilo for $50 during this festive season.